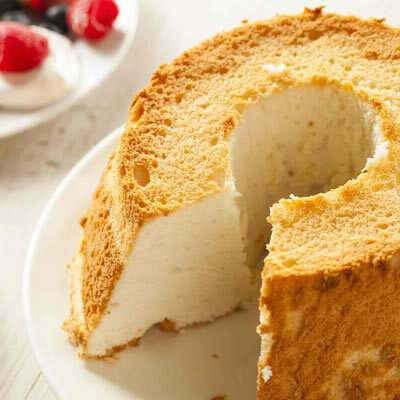 Angel food cake owes much of its consistency to egg whites. Angel food cake is a type of sponge cake made with egg albumen and without added egg yolks and butter. It is a good choice for low fat or low calorie dessert presentation. evaporative loss of water to further enhance rigidity and texture development and chemical reactions of the sugars and proteins that develop color and flavor. Flour: Chlorinated cake flour, which is made from soft wheat flour, is used due to its light texture. This is beneficial for leavening and also contributes to the light texture of the cake. Patent, Greg. “Angel Food Cake.”Gastronomica: The Journal of Food and Culture 13.2 (2013): 9-12. Mleko, S., H.g. Kristinsson, Y. Liang, M.p. Davenport, W. Gustaw, and M. Tomczynska-Mleko. “Rheological Properties of Angel Food Cake Made with PH Unfolded and Refolded Egg Albumen.” LWT – Food Science and Technology 43.9 (2010): 1461-466. Oldham, A. M., D. R. Mccomber, and D. F. Cox. “Effect of Cream of Tartar Level and Egg White Temperature on Angel Food Cake Quality.” Family and Consumer Sciences Research Journal 29.2 (2000): 111-24.